Transfer of CD4+CD45RBhigh T cells into RAG−/− mice causes colitis, which can be prevented by CD4+CD25+ regulatory T cells (Treg). Colitis induction by CD4+CD45RBhigh T cells requires β7 integrin-dependant intestinal localization, but the importance of β7 integrins for Treg function is unknown. In this study, we show that β7−/− Treg were effective in preventing colitis. Treg expanded in vivo to the same extent as CD4+CD45RBhigh T cells after transfer and they did not inhibit CD4+CD45RBhigh T cell expansion in lymphoid tissues, although they prevented the accumulation of Th1 effector cells in the intestine. β7−/− Treg were significantly reduced in the large intestine, however, compared with wild-type Treg, and regulatory activity could not be recovered from the intestine of recipients of β7−/− Treg. These data demonstrate that Treg can prevent colitis by inhibiting the accumulation of tissue-seeking effector cells and that Treg accumulation in the intestine is dispensable for colitis suppression. The transfer of naive or CD4+CD45RBhigh T cells into SCID or RAG−/− mice leads to colitis mediated by Th1 cytokines (1, 2), and this can be prevented by cotransfer of CD4+ CD25+ regulatory T lymphocytes (Treg)5 (3). The mechanisms by which CD4+CD25+ Treg prevent intestinal inflammation in vivo include IL-10 and TGF-β secretion (4, 5, 6, 7, 8). Efficient localization and retention of lymphocytes in the intestine are dependent on β7-containing integrins (9). α4β7 integrin binds to the mucosal addressin cell adhesion molecule 1, which facilitates extravasation of lymphocytes through high endothelial venules in the mucosa (10, 11). The αEβ7 integrin may facilitate entry and/or retention of lymphocytes into the epithelial layer via interactions with E-cadherin-expressing epithelial cells (12, 13, 14). The importance of β7 integrins is evidenced by the paucity of intestinal lymphocytes in mice lacking β7 integrins (β7−/− mice) (15). There also is evidence from experimental models that interaction of α4β7 integrin with mucosal addressin cell adhesion molecule 1 is important for colitis pathogenesis (16, 17, 18). It is not known, however, whether CD4+CD25+ Treg likewise require β7 integrin expression and intestinal homing to prevent disease. In this study, we have analyzed these issues by comparing transferred β7+/+ and β7−/− Treg for their ability to accumulate in different sites and their effects on cotransferred CD4+CD45RBhigh T cells and colitis induction. C57BL/6J, C57BL/6 CD45.1 congenic, and C57BL/6 β7−/− mice (15) were obtained from The Jackson Laboratory. C57BL/6 CD45.1 congenic RAG2−/− mice were obtained from the Taconic Laboratory. Studies were approved by the Institutional Animal Care and Use Committee. Splenocytes were enriched for CD4+ cells by positive selection on MACS columns using anti-CD4 microbeads (Miltenyi Biotec). Cells then were stained with FITC anti-CD45RB (16A), PE anti-CD25 (PC61), and PE-Cy5 anti-CD4 (GK1.5) (BD Pharmingen) and sorted into CD4+CD25−CD45RBhigh (CD45.1+ donors) or CD4+CD25+CD45RBlow (β7+/+ or β7−/− CD45.2+ donors) populations. CD45.1 RAG2−/− recipients were injected i.v. with 5 × 105 CD4+CD25−CD45RBhigh lymphocytes in the presence or absence of 0.5 or 1 × 105 sorted CD4+CD25+CD45RBlow lymphocytes from either β7+/+ or β7−/− mice. Recipient mice were weighed weekly and observed for signs of illness. Intestinal tissue samples were fixed, embedded, stained, and scored as described previously (19). All samples were coded and scored blinded to the experimental conditions. Mucosal lymphocytes were isolated according to a previously published method (20). Isolated splenocytes, peripheral lymph node cells, mesenteric lymph node (MLN) cells, intraepithelial lymphocyte, and lamina propria lymphocyte (LPL) were stained with PE-Cy5 or allophycocyanin anti-TCRβ (H57-597), FITC anti-CD45.1 (A20), PE anti-CD25 (PC61), and PE-Cy5 or allophycocyanin anti-CD4 (GK1.5) (BD Pharmingen). Large intestine IEL (LIEL) or large intestine LPL (LLPL) at 106/ml were stimulated with 10 μg/ml anti-CD3ε clone 2C11 (BD Pharmingen). In cocultures, 1 × 105 CFSE-labeled CD4+CD45RBhigh T cells were cultured at a 1:1 ratio with total CD4+ LIEL/LLPL isolated from RAG−/− transfer recipients. LIEL and LLPL were combined and further purified by positive selection with anti-CD4 microbeads, and the cells were stimulated with 5 × 104 T cell-depleted spleen cells as APC and 1 μg/ml anti-CD3ε for 48 h.
For ELISA or coculture experiments, supernatants or cells were harvested after 48 h. IFN-γ was detected by ELISA following the manufacturer’s instructions (BD Pharmingen). For intracellular cytokine analysis, cells were stimulated for 2 h before the addition of GolgiStop (BD Pharmingen) and cultured for an additional 6 h. Cells were permeabilized and stained with allophycocyanin-labeled anti-IL-4 clone BVD4-1D11 and PE-labeled anti-IFN clone XMG1.2 (BD Pharmingen). Transfer of splenic CD4+CD45RBhigh T cells into RAG−/− mice led to a severe wasting syndrome by 6–12 wk (Fig. 1⇓a), but at 12 wk after reconstitution with CD4+CD45RBhigh T cells and β7+/+ Treg, all recipients appeared healthy and continued to gain weight (Fig. 1⇓a). To assess the role of intestinal localization in Treg function, we used β7−/− CD4+CD25+ Treg. Because it has been reported that αEβ7-expressing CD4+CD25+ Treg are more potent than their αEβ7-negative counterparts from wild-type mice (21), we assessed the potency of CD4+CD25+ Treg from β7−/− mice to ascertain they are not impaired. CD4+CD25+ Treg from β7−/− mice were as capable as wild-type cells in inhibiting the proliferation of CD4+CD45RBhigh T cells in vitro (data not shown). We reasoned that β7−/−CD4+CD25+ Treg might not efficiently repopulate the intestine of recipients. Interestingly, however, β7−/− Treg were also capable of inhibiting all clinical signs of colitis, including weight loss (Fig. 1⇓a). β7−/−CD4+CD25+ Treg prevent colitis. a, CD4+CD45RBhigh T cells from C57BL/6 CD45.1 congenic mice were injected into C57BL/6 CD45.1 congenic RAG2−/− mice in the presence or absence of 1 × 105 CD4+CD25+ Treg derived from CD45.2+C57BL/6 β7+/+ or β7−/− mice. Weight gain/loss was scored weekly. Values are shown as a percentage of original weight. Error bars indicate SEM and the number of mice in each group is indicated in parentheses. Next to the weight loss curves, the average histology scores (H.S.) are indicated. Data represent one of three independent experiments with similar results. b, Mice were transplanted with the indicated cell populations and isolated tissues from the proximal large intestine were sectioned, stained, and scored. Note goblet cell depletion, epithelial disorganization, and massive lymphocytic infiltration in the tissue section from a recipient of CD4+CD45RBhigh T cells without Treg. Original magnification, ×100. Consistent with the lack of weight loss, recipients of either β7+/+ or β7−/− Treg displayed no histological evidence of intestinal inflammation (Fig. 1⇑b). Tissue sections from CD4+CD45RBhigh T cell recipients had an average histological score of 6.1 ± 0.3 (Fig. 1⇑a) and were characterized by inflammatory infiltrate, epithelial hyperplasia, crypt cell damage, and goblet cell depletion. By contrast, when 1 × 105 Treg from either β7+/+ or β7−/− mice were cotransferred, the average histological scores were zero (Fig. 1⇑a). Transfer of only 5 × 104 β7−/− Treg also completely prevented colitis pathogenesis by 10 times as many CD4+CD45RBhigh T cells (data not shown). This is a higher ratio of pathogenic cells to Treg than has been used in most other experiments, suggesting that the β7−/− Treg are highly effective at preventing disease. It remains possible, however, that wild-type Treg are effective at even lower ratios and that β7−/− Treg are slightly impaired compared to wild-type cells. To compare the in vivo expansion of CD4+CD45RBhigh T cells and Treg, tissues were analyzed 10–12 wk after transfer for the ratio of CD4+CD45RBhigh (CD45.1+) T cells:CD4+CD25+ (CD45.2+) Treg. When the input ratio of CD4+CD45RBhigh:β7+/+CD4+CD25+ Treg was 5:1, recipients approximately maintained this 5:1 ratio in almost all organs analyzed, including LPL from the large intestine (Fig. 2⇓). This demonstrates that Treg expanded in vivo in immune-deficient mice to a similar extent as CD4+CD45RBhigh T cells. RAG−/− mice cotransferred with CD4+CD45RBhigh T cells and β7−/−CD4+CD25+ Treg also maintained ratios of CD4+CD45RBhigh T cells:Treg similar to the input 5:1 ratio in the spleen and lymph nodes, but not in the intestine (Fig. 2⇓). In LLPL of recipients of β7−/−CD4+CD25+ Treg, the ratio of CD4+CD45RBhigh T cells:Treg was >20:1. This difference compared with cotransfer of β7+/+CD4+CD25+ Treg was statistically significant (p < 0.05). 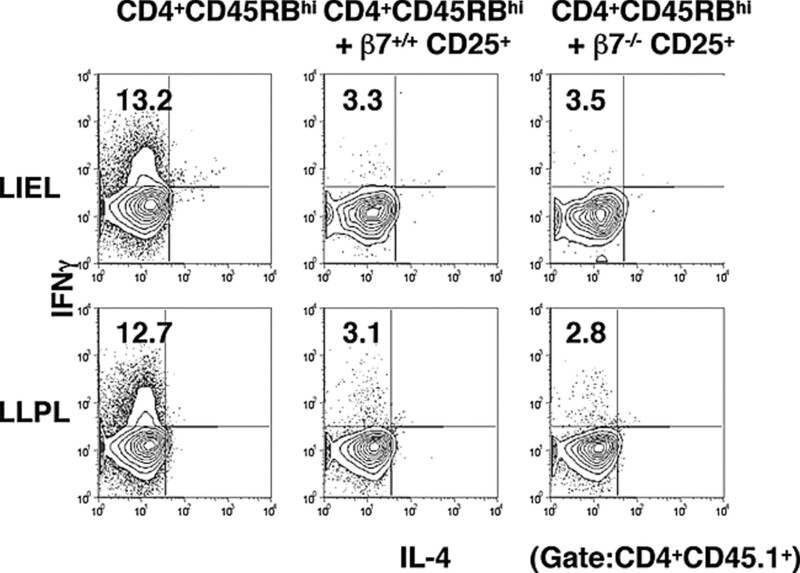 The ratios of CD4+CD45RBhigh T cells:β7−/− Treg were even higher in LIEL. β7−/− Treg fail to accumulate in the large intestine. RAG−/− recipients of a 5:1 ratio of CD4+CD45RBhigh:CD4+CD25+ Treg were analyzed by gating on TCRβ+CD45.2− cells (progeny of donor CD4+CD45RBhigh cells) or TCRβ+CD45.2+ (from donor CD4+CD25+ cells). The composite ratios of CD4+CD45RBhigh:CD4+CD25+ T cells after 12 wk are indicated on the y-axis. Gray bars indicate recipients of β7+/+ and solid bars indicate recipients of β7−/− CD4+CD25+ Treg. Error bars represent SEM and the asterisks indicate a statistically significant difference comparing β7−/− to β7+/+ Treg (Student’s t test). Results shown are from five to nine mice per group. In addition to the ratios, the absolute numbers of donor CD4+CD45RBhigh lymphocytes and Treg in RAG−/− recipients were analyzed. In the absence of Treg, CD4+CD45RBhigh T cells accumulated in all recipient sites analyzed (Table I⇓). As might be expected, this accumulation was especially evident in the large intestinal lamina propria, where the bacterial antigenic load is greatest and inflammation was pronounced. When either β7+/+ or β7−/−CD4+CD25+ Treg were cotransferred, there was no difference in the accumulation of CD4+CD45RBhigh T cells in lymph nodes and an ∼2-fold decrease in the spleen. The presence of Treg had the greatest impact, however, on CD4+CD45RBhigh T cell accumulation in the large intestine. In the lamina propria, CD4+CD45RBhigh T cell numbers were 7.9- to 4.3-fold reduced in recipients of β7+/+ and β7−/− CD4+CD25+ Treg, respectively, compared with recipients without Treg (Table I⇓). A similar reduction in donor-derived CD4+CD45RBhigh T cells was observed in the epithelium. A hallmark of the transfer model of colitis is secretion of IFN-γ and TNF-α by donor lymphocytes in the lamina propria (22). Consistent with this, LLPL derived from recipient mice injected with CD4+CD45RBhigh T cells secreted 36.4 ± 8.5 (SEM) ng/ml IFN-γ upon in vitro restimulation with anti-CD3ε mAb. LLPL cytokine production was decreased to 1.7 ± 0.3 ng/ml when the recipients had received a 5:1 ratio of CD4+CD45RBhigh T cells:β7+/+ Treg. β7−/− Treg had a similar effect, with 1.4 ± 0.3 ng/ml IFN-γ released. This was confirmed by intracellular cytokine staining of anti-CD3-stimulated LIEL or LLPL from the recipients. Cotransfer of either β7+/+ or β7−/−CD4+CD25+ Treg greatly reduced the percentage of progeny of the donor CD4+CD45RBhigh T cells that produced IFN-γ (Fig. 3⇓), while no intracellular IL-4 was detected. Cotransfer of β7+/+ or β7−/−CD4+CD25+ Treg also led to a decreased percentage of LIEL that could be stimulated to produce TNF, but there was no decrease in the percentage of TNF producing LLPL or cells from MLN (data not shown). Since the absolute number of donor T cells in the large intestine was markedly decreased (Table I⇑), however, the absolute number of TNF-producing cells in the intestine was correspondingly decreased. Intestinal IFN-γ production is suppressed by β7−/− Treg. LLPL and LIEL were isolated from RAG−/− recipients of CD45.1+CD4+CD45RBhigh T cells alone or cotransferred with either β7+/+ or β7 −/−CD4+CD25+ Treg 10–12 wk after reconstitution. The cells were stimulated in vitro with anti-CD3ε and analyzed for intracellular cytokine. Dot plots are gated on TCRβ+CD45.1+ cells and the numbers represent the percentage of positive cells in the indicated quadrants. The very low numbers of Treg in the intestine of protected RAG−/− recipient mice were not sufficient for purification and in vitro assay, although it remained possible that the few cells in the intestine were extremely potent. 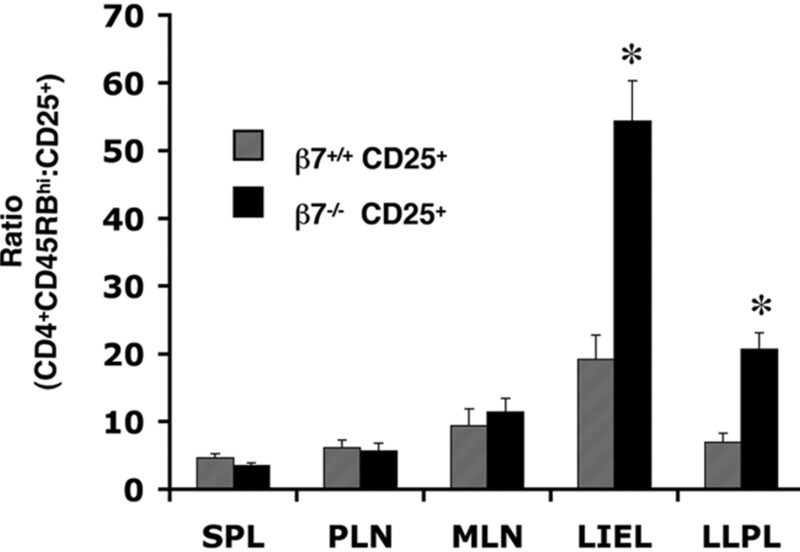 To address this issue, β7+/+ or β7−/− Treg were cotransferred with CD4+CD45RBhigh T cells into RAG−/− mice, and the combined total CD4+ LIEL and LLPL from the recipients were assessed for their ability to inhibit the proliferation of naïve CD4+CD45RBhigh cells from the spleen of wild-type mice (Fig. 4⇓a). As total CD4+ cells from the intestine of recipient mice were added to the naive spleen cells, the majority could not have been Treg. We reasoned, however, that if Treg acted locally to prevent inflammation, then in a 1/1 dilution in culture they still might be able to prevent proliferation in vitro. Intestinal T cells from mice cotransferred with β7+/+ Treg and CD4+CD45RBhigh T cells prevented the in vitro proliferation by CFSE-labeled, naive spleen cells (Fig. 4⇓b). In dramatic contrast, intestinal T cells obtained from mice that had been cotransferred with β7−/− Treg could not inhibit naive T cell proliferation in vitro. These data indicate that although β7+/+ Treg in the intestine contributed to ex vivo regulatory function, this activity was not a prerequisite for protection from colitis in vivo. Regulatory activity cannot be detected in the intestine of recipients of β7−/− Treg. Total CD4+ T cells obtained from combined LIEL and LLPL were isolated from RAG−/− recipients of CD4+CD45RBhigh T cells in combination with either β7+/+ or β7−/−CD4+CD25+ Treg. These cells were cultured in vitro with CFSE-labeled CD4+CD45RBhigh T cells, anti-CD3ε, and Thy1-depleted, irradiated splenocytes as diagrammed. Cultures were harvested after 48 h and proliferation was analyzed by flow cytometry. 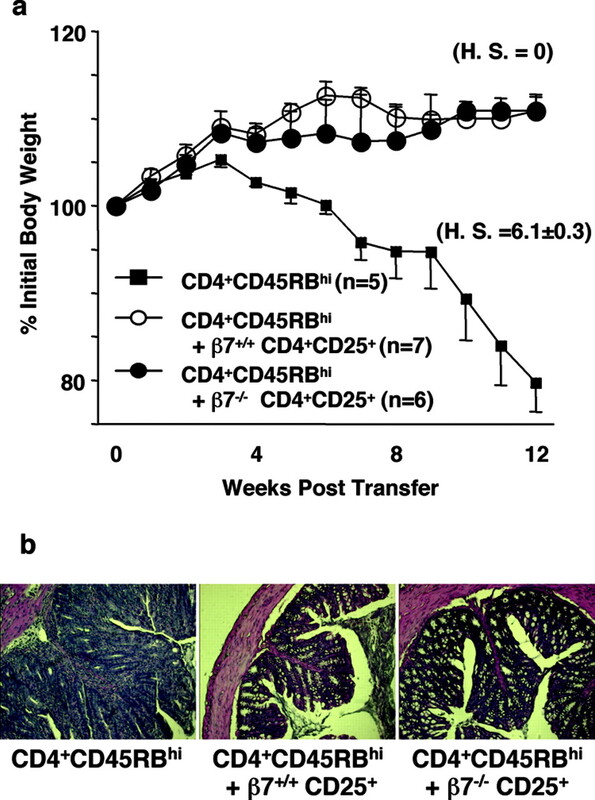 In this study, we provide evidence that β7−/−CD4+CD25+ Treg are impaired in their ability to populate the intestine during cotransfer with CD4+CD45RBhigh T cells into RAG−/− mice and therefore are greatly out numbered in the large intestine by progeny of the CD4+CD45RBhigh donor T cells. Despite this, they are capable of preventing intestinal inflammation and the associated Th1 polarization of pathogenic T cells in the intestine as Treg from wild-type mice. Therefore, while T cell pathogenesis in this colitis model is dependent on β7 integrin expression (16), T cell-mediated regulation is not. Alteration of the initial differentiation of naive T cells in the periphery may be a fundamental mechanism as to how Treg prevent inflammation in the transfer model of colitis (23). Consistent with this possibility, we showed that both β7−/− and β7+/+CD4+CD25+ Treg migrated to the spleen and lymph nodes and expanded as efficiently there as CD4+CD45RBhigh T cells. In experimental autoimmune encephalomyelitis (24) and diabetes in mice (25), it also was shown that transferred, protective Treg accumulated primarily in the peripheral lymph nodes and failed to infiltrate the target organ. Although the β7 independence of Treg action is proven, we cannot formally exclude the possibility that the very few β7−/− Treg in the intestine contributed to the prevention of colitis. It is evident, however, that even with a 10-fold excess of CD4+CD45RBhigh T cells transferred, and impaired mucosal localization of Treg due to β7 deficiency, that Treg function was not markedly diminished. Furthermore, because no regulatory activity could be detected in the intestine of recipients that received β7−/− Treg, it is highly unlikely that the very few β7−/− Treg in the intestine were exceptionally potent suppressors. The mixture of CD4+ T cells in the large intestine after cotransfer of wild-type Treg and CD4+CD45RBhigh T cells could prevent the proliferation of naive T cells in vitro. Our data therefore are consistent with the hypothesis that wild-type Treg can act in the intestine as well as in lymph nodes. It remains to be determined whether the local Treg stimulated some of the progeny of the CD4+CD45RBhigh T cells in the intestine to convert to Treg (26), although this did not happen when β7−/− Treg were transferred. It was reported recently that CD4+CD25+ Treg can treat established colitis, and it was suggested that in this case the Treg were regulating pathogenesis in the intestine (27). It is conceivable that the major site of action of Treg will depend on the experimental model, with the extent of preexisting inflammation as one critical variable. In a previous colitis study, it was found that cotransfer of equal numbers of Treg and CD4+CD45RBhigh T cells reduced the systemic expansion of the CD4+CD45RBhigh T cells more efficiently, compared with our data generated by a cotransfer of much higher ratios of CD4+CD45RBhigh T cells:Treg (7). This suggests that Treg are versatile suppressors, and the mode of action and extent of immune suppression caused by Treg transfer could be highly dependent upon the number of cells transferred. Our data indicate that the effects of either the β7+/+ or β7−/− Treg were concentrated in the intestine, where the total number of infiltrating CD4+CD45RBhigh T cells was reduced and the ability of the few cells in the intestine to produce Th1 cytokines diminished. These results indicate that in our experiments Treg acted by inhibiting the generation of tissue-seeking Th1 effector cells, which is sufficient to prevent disease in the transfer model of mouse colitis. We thank Dr. Olga Turovskaya for histology and scoring of tissue sections, Samuel Connell and The Scripps Research Institute Flow Cytometry Core Facility for assistance with cell sorting, and Dr. Hilde Cheroutre for critical reading of this manuscript. ↵1 This work was supported by National Institutes of Health Grants PO1 DK46763 and RO1 AI 65016 (to M.K). T.L.D. is a recipient of a Jeane B. Kempner Scholarship from the University of Texas Medical Branch at Galveston. G.K. is the recipient of a Career Development Award from the Crohn’s & Colitis Foundation of America. ↵2 This is publication number 677 from the La Jolla Institute for Allergy & Immunology. ↵3 T.L.D. and G.K. contributed equally to this work. ↵5 Abbreviations used in this paper: Treg, regulatory T cell; MLN, mesenteric lymph node; LIEL, large intestine intraepithelial lymphocyte; LLPL, large intestine lamina propria lymphocyte. Morrissey, P. J., K. Charrier, S. Braddy, D. Liggitt, J. D. Watson. 1993. CD4+ T cells that express high levels of CD45RB induce wasting disease when transferred into congenic severe combined immunodeficient mice: disease development is prevented by cotransfer of purified CD4+ T cells. J. Exp. Med. 178: 237-244. Powrie, F., J. Carlino, M. W. Leach, S. Mauze, R. L. Coffman. 1996. A critical role for transforming growth factor-β but not interleukin 4 in the suppression of T helper type 1-mediated colitis by CD45RBlow CD4+ T cells. J. Exp. Med. 183: 2669-2674. Bargatze, R. F., M. A. Jutila, E. C. Butcher. 1995. Distinct roles of L-selectin and integrins α4β7 and LFA-1 in lymphocyte homing to Peyer’s patch-HEV in situ: the multistep model confirmed and refined. Immunity 3: 99-108. Butcher, E. C., L. J. Picker. 1996. Lymphocyte homing and homeostasis. Science 272: 60-66. Holzmann, B., I. L. Weissman. 1989. Integrin molecules involved in lymphocyte homing to Peyer’s patches. Immunol. Rev. 108: 45-61. Schon, M. P., A. Arya, E. A. Murphy, C. M. Adams, U. G. Strauch, W. W. Agace, J. Marsal, J. P. Donohue, H. Her, D. R. Beier, et al 1999. Mucosal T lymphocyte numbers are selectively reduced in integrin α E (CD103)-deficient mice. J. Immunol. 162: 6641-6649. Cepek, K. L., C. M. Parker, J. L. Madara, M. B. Brenner. 1993. Integrin αEβ7 mediates adhesion of T lymphocytes to epithelial cells. J. Immunol. 150: 3459-3470. Wagner, N., J. Lohler, E. J. Kunkel, K. Ley, E. Leung, G. Krissansen, K. Rajewsky, W. Muller. 1996. Critical role for β7 integrins in formation of the gut-associated lymphoid tissue. Nature 382: 366-370. Sydora, B. C., N. Wagner, J. Lohler, G. Yakoub, M. Kronenberg, W. Muller, R. Aranda. 2002. β7 Integrin expression is not required for the localization of T cells to the intestine and colitis pathogenesis. Clin. Exp. Immunol. 129: 35-42. Shigematsu, T., R. D. Specian, R. E. Wolf, M. B. Grisham, D. N. Granger. 2001. MAdCAM mediates lymphocyte-endothelial cell adhesion in a murine model of chronic colitis. Am. J. Physiol. 281: G1309-G315. Picarella, D., P. Hurlbut, J. Rottman, X. Shi, E. Butcher, D. J. Ringler. 1997. Monoclonal antibodies specific for β7 integrin and mucosal addressin cell adhesion molecule-1 (MAdCAM-1) reduce inflammation in the colon of scid mice reconstituted with CD45RBhigh CD4+ T cells. J. Immunol. 158: 2099-2106. De Winter, H., D. Elewaut, O. Turovskaya, M. Huflejt, C. Shimeld, A. Hagenbaugh, S. Binder, I. Takahashi, M. Kronenberg, H. Cheroutre. 2002. Regulation of mucosal immune responses by recombinant interleukin 10 produced by intestinal epithelial cells in mice. Gastroenterology 122: 1829-1841. Aranda, R., B. C. Sydora, P. L. McAllister, S. W. Binder, H. Y. Yang, S. R. Targan, M. Kronenberg. 1997. Analysis of intestinal lymphocytes in mouse colitis mediated by transfer of CD4+, CD45RBhigh T cells to SCID recipients. J. Immunol. 158: 3464-3473. Lehmann, J., J. Huehn, M. de la Rosa, F. Maszyna, U. Kretschmer, V. Krenn, M. Brunner, A. Scheffold, A. Hamann. 2002. Expression of the integrin αEβ7 identifies unique subsets of CD25+ as well as CD25− regulatory T cells. Proc. Natl. Acad. Sci. USA. 99: 13031-13036. Barthlott, T., G. Kassiotis, B. Stockinger. 2003. T cell regulation as a side effect of homeostasis and competition. J. Exp. Med. 197: 451-460. Kohm, A. P., P. A. Carpentier, H. A. Anger, S. D. Miller. 2002. Cutting edge: CD4+CD25+ regulatory T cells suppress antigen-specific autoreactive immune responses and central nervous system inflammation during active experimental autoimmune encephalomyelitis. J. Immunol. 169: 4712-4716. Sarween, N., A. Chodos, C. Raykundalia, M. Khan, A. K. Abbas, L. S. Walker. 2004. CD4+CD25+ cells controlling a pathogenic CD4 response inhibit cytokine differentiation, CXCR-3 expression, and tissue invasion. J. Immunol. 173: 2942-2951. Mottet, C., H. H. Uhlig, F. Powrie. 2003. Cutting edge: cure of colitis by CD4+CD25+ regulatory T cells. J. Immunol. 170: 3939-3943.